A few weeks ago I did a wonderful botanic art course at Inverewe gardens and came away feeling inspired to paint and draw more botanical subjects. I have quite a large garden myself, spring has come late this year and I had a limited choice of subjects. So I asked Joanna MacPherson at Attadale Gardens if I could sketch at their gardens from time to time. Joanna was kind enough to say yes, so, my friend Lorna and I spent a wonderful afternoon walking and sketching amongst the Rhodedendrons and hosts of daffodils. Sketching botanicals outside is quite a different experience from working on one speciman. I’m learning loads though and feel very lucky that I have such a wonderful place to practice! It really has been a very, very busy couple of months and trying to balance painting and everyday life has been quite a challenge. 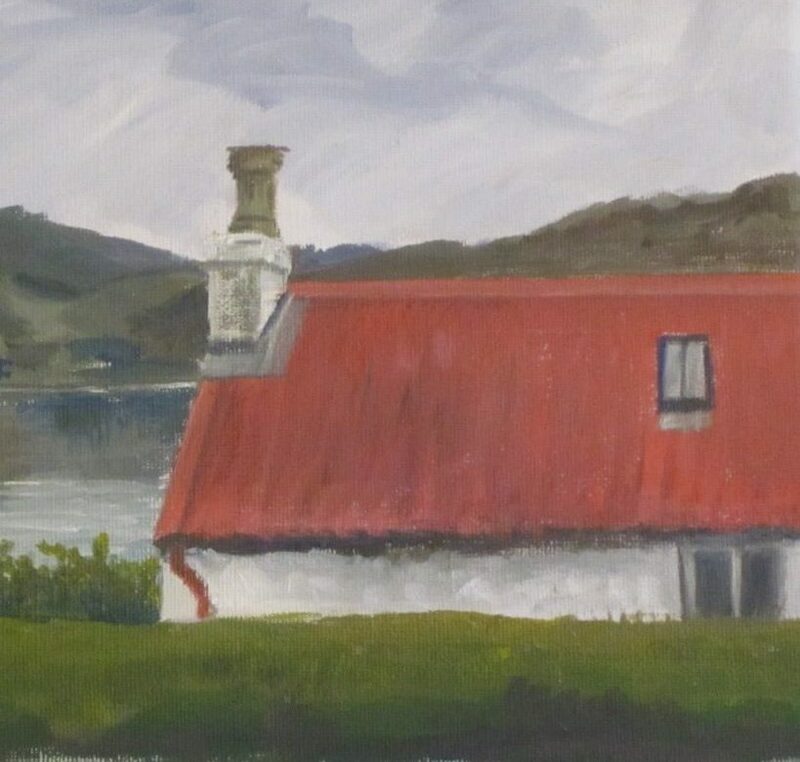 My last blog post was about the exhibition at the wonderful Skyeworks Gallery and since then, I’ve completed several paintings for a month-long exhibition at the GALE Centre in Gairloch. I’ve also attended an amazing, inspiring three day botanical art course with two wonderful artists Jacqui Pestell and Sarah Rogers both of whom are tutors at The Royal Botanic Gardens, Edinburgh. It’s a totally new way of painting for me, and it was very much an introduction course, I have a LOT to learn. However, I did enjoy it, even if it is a pretty different way of painting from my usual work, a lot to think about. I’ve also been working away in my garden, my new greenhouse has arrived and (just!) needs assembling. I’ve been sketching the changes in my garden for some time, I’ll share them in a future post. It’ll be interesting to see how different my new sketches might be from the ones I did last year before my alla prima oil course, and the recent watercolour course at Inverewe. I have work to varnish and frame, for Carron Restaurant‘s oyster festival this weekend, oh, and they also all need a bit of ‘bling’ to finish them. Meanwhile, I’ve brought a wee Hellebore plant that I bought at Inverewe Gardens last weekend, along to Lochcarron Gallery with me, to keep me busy sketching this afternoon. It’s been a very busy few weeks, getting ready for several exhibitions. I was lucky enough to be invited to submit some work for the recent fish exhibition at the Skyeworks Gallery Now that I’m painting in oils so much of the time I have to prepare much earlier than I used to as oil paint take so much longer to dry. I’m very lucky to live in a part of the world where I have access to the most wonderful fresh seafood and I couldn’t resist painting some of it for the exhibition. It was also great to be able to eat my subject when I had finished painting! I really enjoyed painting the sushi paintings, I loved the bright colours and patterns that this sort of seafood creates. I loved arranging and rearranging them until I was happy with the layout and adding crockery and chopsticks, both of which helped add strong elements to the compostions. Some of you may remember a blog post I wrote in January about the sketches and paintings I had done of the lovely sailing boat Britannia. It was quite a challenge for me, as it was a large painting and I wanted to convey how beautiful she was and convey a sense of optimism for the future. I did a lot of sketches first and then a final painting (which is below). They were exhibited with a number of other stunning images of the boat. Until the exhibition, the trust only had photos of the boat taken in the 1990s and earlier, which, though they provide a moving and evocative archive of Britannia’s history, none of them were of good enough quality to make reproductions from. The trust plan use the new images to produce a series of cards, Giclee prints and other items and sell them at various events to raise funds to help towards her restoration. When she is restored the trust plan to use her to help raise awareness of the issues surrounding climate change, especially plastic pollution and the effect on the world’s oceans. Since David Attenborough’s Blue Planet 2 series highlighted the shocking effect of plastic waste in our seas a lot of people have become aware of what a serious problem it is, but the Britannia Trust have been trying to highlight this problem for several years. They have also produced a lovely film which tells Britannia’s story in more depth. It’s deeply moving and well worth watching the film it’s almost an hour long, so settle down with a cuppa, put your feet up and enjoy! Meanwhile, my finished painting was very well received and will hopefully raise some money for this very worthy cause. The last few weeks have been madly busy and I have several things I want to blog about, but I just haven’t had the time. I’ve been painting nearly every day, mostly in alla prima oils. I’m taking part in an exhibition at the very wonderful Howard Doris Centre, here in my village and I wanted to have some new work ready for it. The exhibition’s on Monday and will be for three days, I probably going to put in ten or so pieces of work. A mixture of landscapes, interiors and maybe a still life or two. It’s still a new medium for me, but I’ve really fallen in love with oils, I love the richness of colour that oils give the artist, but it is still a different way of working and has it’s own challenges. Oils take a long time to dry so I can’t just stack them against the wall, which is what I’ve always done with my acrylic paintings, so my easel and the photo shelves that I use were full of wet paintings for a week or two. Then everything needs to be varnished. I don’t usually varnish my acrylics because I don’t like way it looks, but varnish seems to really enhance the colours when used with oils. Luckily, it was a glorious day today and I varnished all my recent (dry) work, then brought it in to dry indoors. When the varnish was dry I had to frame everything. I have a selection of DIY frames that I buy from various outlets. Sometimes they might sit in my studio for a while, but eventually, just the right painting will come along. This seascape really works well with this black frame which has been in my frame cupboard for a long time, but they seem made for eachother. This is one of the larger of the paintings that I’m submitting to the exhibition. The other is in a plain light wood frame. The Howard Doris Centre has a lovely lounge area, with bright, comfy chairs, which encourage people to sit and chat, make new friendships and strengthen others. There are large bright windows which overlook the loch outside, the views are beautiful, but people are often far more interested in what’s happening in the lounge than the view outside. There is a welcoming lobby at the centre comfy chairs flank tables with white tablecloths and fresh flowers, somewhere to sit and read the paper, wait for a lift or watch the world go by. This one speaks for itself I hope, all of the visitors and residents at the centre are made welcome, some people spend most of their days here and they are truly missed when they are gone. My painting will be on exhibition there and the Trust will then sell cards, mugs and possibly prints with the images from the exhibition. This painting has been quite a challenge. Although I’ve painted boats in the past I have never worked on anything quite so detailed or intricate as this boat. Britannia hasn’t actually sailed for several years, so there were only old photos of her, (above) which presented a number of difficulties. None of the images were very large, so seeing detail was not easy, getting the colour right was also a challenge. I needed to work on both colour and composition, trying to get the balance right I did a number of sketches and small paintings. Getting the colour right on the sail was interesting as the sails are such a deep colour. I also wanted the composition to show movement, to show Britannia sailing again. The photo I had with the most detail was the middle one of the three photos above. The last two sketches were the ones that I thought had the most movement and worked best for what I had in mind. As you can see from the photo above I managed to get a decent likeness of the photograph, however I changed the compostion so that Britannia is sailing into the sun. Below is the finished painting, which will be presented this weekend. The trust will use the image for cards and merchandise to help raise funds to restore the boat, along with images from a number of gorgeous paintings of the boat that they have collected over the years. I’ve also put my sketches in mounts and they will be on sale too. I’ll keep you posted as to how we all get on. I’m still loving painting alla prima, which entails painting in oils, wet paint on wet paint. It’s quite challenging, but great fun and often means a bright, fresh painting – at least that’s what the artist aims for. To keep the momentum up I signed up to do a five day challenge with artist Mary Gilkerson. The idea was to paint a painting every day, in less than 30 mins and ideally in less than twenty. Mary suggested that it’s easier to paint in a theme, so as I’ve been working on still-life recently, that’s what I decided to concentrate on. I needed to simplify my composition though, so I focussed on painting cakes, easier to manage in a short time that a whole set-up, but great fun too. The cupcakes took me longer than the other paintings. The first one was a full 30mins, the second was just under 30 and the other three were 20 mins each. As per Mary’s advice I prepared my pallette in advance and sketched out my compostions in advance, but that is good practice for alla prima anyway. I initally thought that painting like this would be more like a detailed sketch, but it didn’t work that way, each painting is complete in itself. My plan now is to let these dry and then see if they need any final details. I’ve used small deep-edged canvases for these paintings, canvases that I wasn’t using otherwise. The challenge has encouraged me. I plan on continuing daily painting as often as possible over the next few months but I’ll be looking for slightly larger canvases than these ones. New genre too. I’ve been back in the studio over the last couple of days. I’m working on a couple of acrylic commissions that I can’t share right now – though more about them soon – but I’m also trying to do a painting every couple of days. I took an online Alla Prima art course last year with Irish artist Roisin O’Farrell which made me look at my painting process in a totally different way. I’ve never really been interested in painting Still Life or Interiors before and I hadn’t painted in oils for over thirty years, so I really had a lot to learn. I shared a couple of my earlier paintings on this blog, and I had great fun painting them, but now I feel I’m really getting to grips with the medium again. It is, quite simply, very different from Acrylics. I stopped painting in oils after art college because my husband is allergic to turps, which meant there was no way I could use them in my home studio. Acrylics are much more convenient, they clean up with water and dry much more quickly, which also means they can be painted over if the artist makes any mistakes. Oil paints and the associated mediums have changed so much in the last few decades. The paints I am using are “Winton” by Winsor and Newton, they don’t need any additional medium so I’m not having to use linseed oil or “Liquin” which seems to be a favourite mixer to use with ‘artist’ quality paint. Winton paints can be used straight from the tube. I’m also using “Zest It” for the clean-up which is much nicer to use than turps. My pallette is quite simple, I’m using Ultramarine Blue, Cerulean Blue, Sap Green, Veridian Green, Cad Red, Cad Yellow, Lemon Yellow, Yellow Ochre, Burnt Umber and Alizarin Crimson and white. I’ve been painting Alla Prima, which means careful drawing and mixing colours in advance and then painting quite quickly and fairly thickly. My first painting was the oranges on the blue plate, the second was the tomatoes and then I painted the lemons and I’ve learned a lot from each one. I love the buttery texture of the paint and the rich deep colour, thouh they are very hard to photograph as the paint is very shiny when wet, and they are not going to even be touch dry for a long time yet. I may have to find somehwhere to store them while they’re still wet. I’m planning on painting a landscape next, but I’ll need some more paint first. I’ll let you know how I get on. I’ve been hoping to make a round up post since last Friday, but somehow the days just got away from me and it’s the third of January already. 2017, was a strange year. I had a bit of a crisis of confidence and a massive block for the middle part of the year, but then still managed to complete over fifty paintings, I’m really not sure how that happened! I think that being more active online and joining some online groups helped, it’s certainly what got be back to the studio in the second half of the year. I managed to get back in the studio today for the first time this year. I already have quite a few works in progress so more on those soon. I think I might be getting better at this blogging thing. It’s only been a month since I last posted, practically a record for me. In November I’ve been working away on commissions and Christmas makes. I do love this time of year. Painting a commission is always a challenge, but when it works out and the person who commissioned me likes what I’ve painted it becomes a real joy. I’ve also been trying to keep up with my online oil painting course with Roisin O’Farrell. I’ve got so much to say about this course, it really has been thought provoking and pretty challenging too. Not so much the painting aspect, that’s been a lot of fun. However, what Roisin calls the “poetry”, that is something else. I’ll try and write a bit more about it next time, but I highly recommend Roisin’s courses if you are ever lucky enough to be able to take one.